The Musselburgh leek is a mid-season leek, grown in Central and Eastern Scotland. Compared to more popular French varieties of leek it has a shorter, thicker white stem and a longer green flag, a common feature of Scottish leeks. 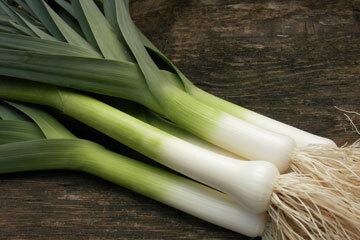 The leeks are suited for the harsher Scottish conditions, and are known for their robust resilience. Therefore they are perfectly suited for the tougher winter conditions often associated with Scotland. Ideally the Musselburgh leek is planted in May and can be harvested from September till March. Leeks have been grown in Scotland since the Middle Ages, but attempts to improve the varieties of leeks since the 18th Century led to the introduction of the Musselburgh leek to the market in 1834. Market gardens were an important trade in Musselburgh, supplying vegetables to major towns and cities in Scotland such as Edinburgh. Leeks from this area were considered superior to other varieties from around Scotland. The Musselburgh leek is not sold commercially as a vegetable, only in seed or plant form, and therefore remains relatively unknown. This, combined with a low leek variety being offered to consumers, means that there is very little demand for the Musselburgh leek and its special growing and taste characteristics.